created a journey of Kindred Spirits. both creative, and talented in the many ways. Tori was following our Facebook Group called the Silhouette Challenge. All of this handmade work swirling through the words of our members. Each post a person, pictures of a new project, with loads of encouragement below. Others asking for an opinion, which looks better? Where do you get the best vinyl? Tricks to keep your machine running smoothly, and money savings tips too. Tori Set up an event Handmade Gift Exchange asking people to participate, then she split us into pairs sent us our present partners, gave us ideas how to get to know each other, and of course a deadline for when the packages to ship. As you can see from above, is how I met my kindred spirit Karen. We have not met in person but, we have corresponded like modern day pen pals. What I learned from Karen inspired me to make a gift to honor her family. This would be my first vinyl project. 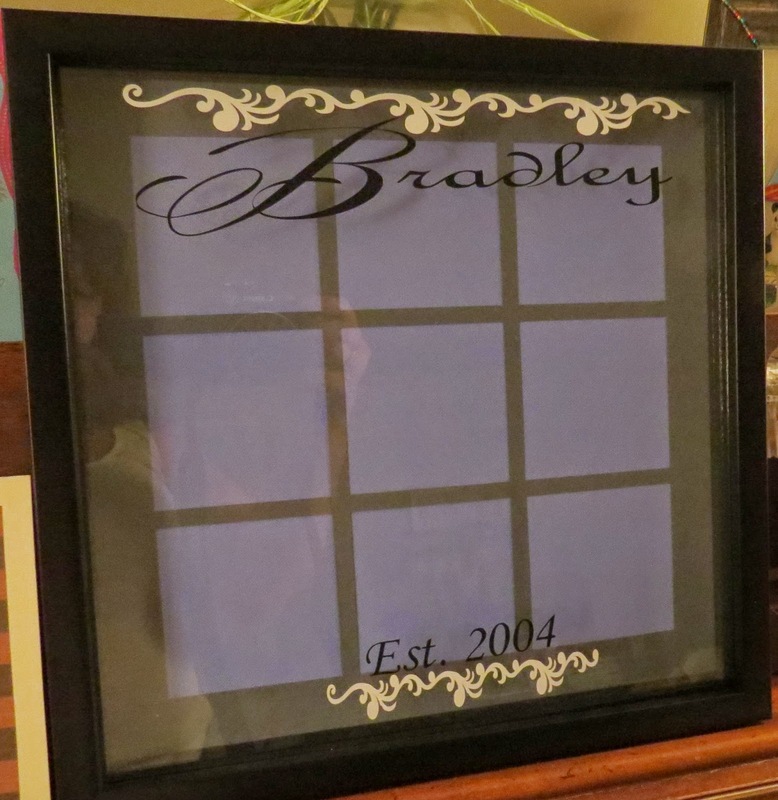 I decided a picture frame with the family name, marriage year and embellishments in vinyl. I added 9 square gray photo mat to the 12" X 12" Frame. I used to Fonts Styles Madrian Demo for the B.
Monotype Corsiva in the rest. I used colors I saw in Karen's pictures on Facebook. I made a card to acknowledge the many happy occasions Karen's family have reasons to celebrate. My printer would not cooperate but it is the thought that counts. No pictures needed of that plus it was private. Here is the lovely gift Karen crafted for me. We just Celebrated our 30th Wedding Anniversary. 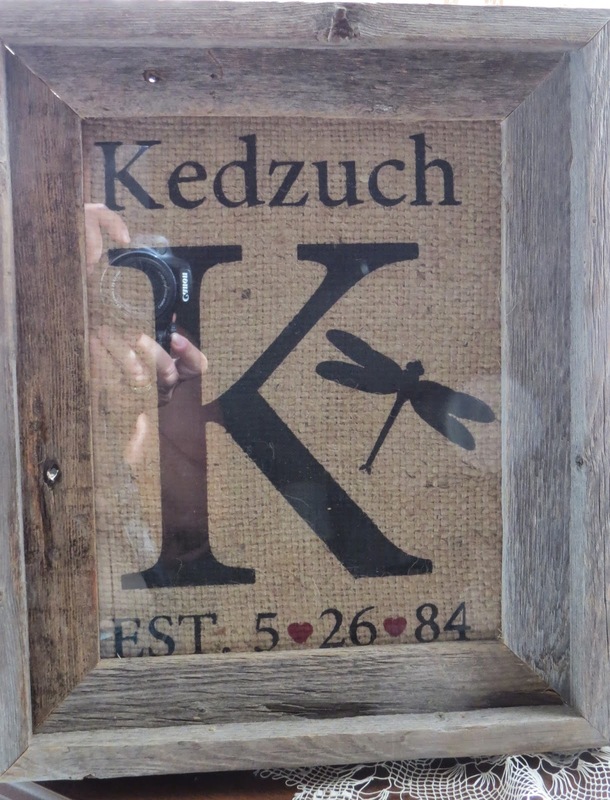 I love barnwood, burlap, monograms, a Dragonfly, is an important symbol to me. If you haven't read this previous post click on the word to find out more. I started this journey expecting to make a special gift and receive a gift from a stranger. The most interesting part of the exchange is I found a Kindred Spirit, which I now call my friend. I know in the future we will meet in person. Until then I am grateful for my modern day pen pal. What a wonderfully sweet post. I am glad you were paired with such an awesome partner! Love the great idea of using the frame! Two Karens! It was meant to be! I love the frame! What a great idea! And yes, I love exclamation points! Thank you for your comment. this project sure was fun. Thank you my partner made it easy to think of something for her because, she is such a sweetheart. You nailed me on the exclamation points. Yep! I love them to express my excitement. Thank you for sending me such a nice comment. I am glad you liked the Frame! 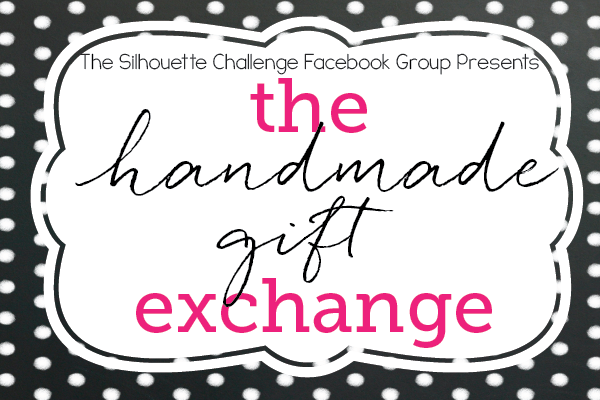 I love how blogging and our Silhouette Challenge group has put me in contact with so many kindred spirits who have become true friends...and it's neat to see that happening now as a result of the handmade gift exchange. Your gifts seemed to be so perfect for each other! Thanks for the inspiration! Wow! What a neat story!! I'm so happy that you were partnered with such a wonderful partner. I love that those who participated have found new friends:) That makes me happy! Your gifts turned out amazing. Cute! I love working with vinyl! Look what you did with that little spark of an idea. This SC group has inspired me to reach beyond my comfort zone, I can tell you have done the same. I am so glad you stopped by and were thoughtful enough to leave a comment. I am very grateful for your encouragement.